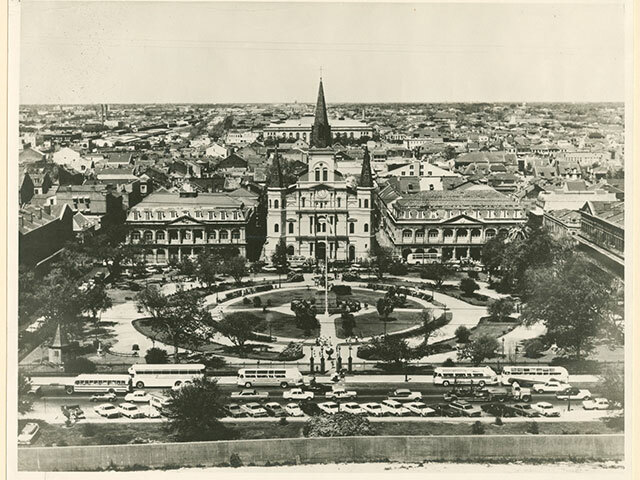 Situated on a bend of the Mississippi River, just above sea level, the land on which French Quarter sits was traversed by Native peoples long before the arrival of Europeans and Africans in the early 18th century. The French Quarter Galleries explore how and why this neighborhood developed, how life has been lived here by various populations in different times, and how the legacies that remain shape our lives today. The story of the city’s original footprint is presented thematically, covering arts, music, and culture; the neighborhood’s various populations; transportation; communications; the slave trade; commerce, and more. Over 300 original artifacts and video and audio content from THNOC’s holdings are complemented by state-of-the-art interactive technologies. In the first gallery, an ever-changing animated and graphic word cloud provides an at-a-glance overview of topics covered by the exhibition. Sensors embedded throughout the gallery update the word cloud with the words or objects people engage with the most. New media artist and New Orleanian Xiao Xiao, along with collaborator and fellow alumni from the Massachusetts Institute of Technology Don Derek Haddad, developed the word cloud. In another gallery, an immersive film, The French Quarter by Night, is projected on all four walls, filling the space with imagery and sound. Viewers are taken on an epic 17.5-minute journey over more than 300 years, from a mosquito-infested Mississippi River bank prior to Native American settlement, to a modern night in the midst of the Krewe de Vieux parade. The film was developed by Michelle Benoit and Glen Pitre of Côte Blanche Productions.